The great thing about Hanukkah is that you can celebrate it at different levels, according to the age of your child. At its root, Hanukkah is a joyous eight-day celebration commemorating the victory, more than 2,000 years ago, of the Maccabees over enemies who wanted the Jews to give up their religion. After the Jews won back the Temple in Jerusalem, they wanted to rekindle the “ner tamid”, the eternal light. But there was only one vat of purified oil that should have lasted a single day. There was a miracle however, and that small amount of oil lasted for eight days. As children get older, you can amplify the discussion by delving into the complex issues of religious persecution and freedom. If you want young children, say 4 to 10, to have a basic understanding of the festival, it’s helpful to build celebrations around three core concepts. We recommend Light, Miracle, and Oil, because they’re fundamental to the holiday – and they are easy for parents to put into practice, easy for children to grasp, and easy to reinforce. The basic traditions of a Hanukkah celebration include kindling the Hanukkah candles, singing candle-lighting blessings about the miracles, and eating foods fried in oil such as potato pancakes (latkes) and doughnuts. The nuances however, go far beyond this inviting participation and understanding. To underscore that the miracle of the oil lasting grew greater each night, we light one candle on the first night of Hanukkah, two candles on the second, and so on. (Note: we light the candles with a helper candle, called a “shamash.”) We continue the process for eight days, until a truly lovely light comes from the menorah. And we place the menorah in a window – facing the dark of the winter sky – to proclaim the miracle to the world. 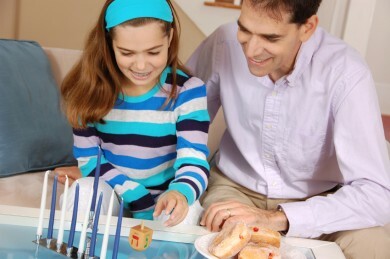 Even as young as two or three, kids can choose which color candles they want to put in the menorah – and in which order. In that way, they are “designing” the menorah for the evening. When they’re a few years older, with supervision, they can kindle the lights. They take great pride in these responsibilities. Then there’s the dreidel game, which also underscores the miracle. On each side of the dreidel (a small top), there is a Hebrew letter that stands for the words “Nes gadol haya sham,” or “A great miracle happened there.” Initially, kids learn the letters: Nun (for Nes), Gimel (for Gadol), Hey (for Haya), and Shin (for Sham) – so that they know whether they’ve won that round. For instance, if your dreidel lands on “gimel,” you take the whole pot. Later, you’ll be amazed when you watch your children and their friends play intense games, competing to see whose dreidel spins the longest – or who can flip the dreidel to spin on its narrow top! Baking Hanukkah cookies is another tradition. Little hands can help by sprinkling the uncooked cookies with colored sugar, made by stirring white sugar with a few drops of food coloring until it’s a nice consistency. Older children can use new paintbrushes to make stained glass cookies (made with an egg yolk mixture mixed with food coloring). By nine or so, kids can roll dough and use cookie-cutters to make classic candle, dreidel and star shapes – then decorate them with frosting, red hots, chocolate chips, licorice strips, and so on. So how do you fit all this into a busy schedule for eight nights? We recommend celebrating right after dinner. Light the candles, sing the blessings, and play dreidel and enjoy special treats as the candles burn down. If your tradition is to give gifts, you can do that during this time, also. In about 30 minutes, the candles are out – and it’s bath and bed time. Involve your kids in the tradition with a Family Hanukkah Kit from Jewish Holidays In a Box, LLC. Marketer, teacher and writer, Ellen Zimmerman launched Jewish Holidays in a Box, LLC., developers of comprehensive Jewish holiday kits, to help interfaith and Jewish families celebrate with more joy, less stress. You can follow Ellen on Facebook or read her blog. this is a great intro to the holiday for non-Jewish children, too. Thanks!